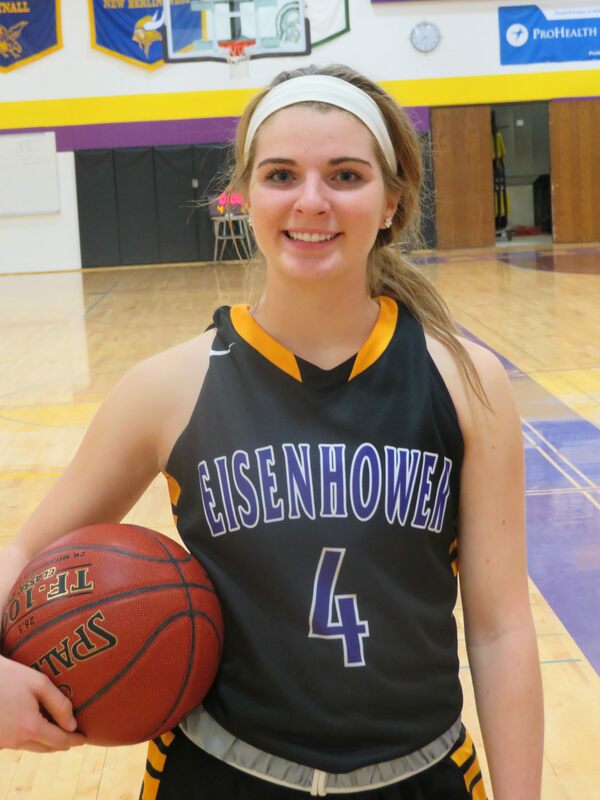 Last season New Berlin Eisenhower freshman Julia Hintz started on a team which won the WIAA Girls State Division 2 Championship. When asked if she feels any pressure this season since she is considered by many the top returnee, the 5-foot-7 inch guard answers candidly. "I feel more pressure," Hintz said. "It puts a lot of pressure on me and (junior guard) Katie (Ludwig) because we always have to have a good game on shooting and I think that's really hard. But Katie and I are doing well in getting the offense set and really ready for upcoming games." Hintz is coming off a season where she was second-team All-Woodland as a freshman. She led the Lady Lions in free throw percentage (.761), 3-pointers (52), 3-pointer percentage (.423), 66 assists and 49 steals. She was second in points per game (8.5) and third in field goal percentage (534). The Lady Lions are off to a good start with a 9-4 start, currently in second place (7-1) in the rugged Woodland West. Hintz is doing her part, as she tops the team in scoring (13 points), field goals made (57), free throw percentage (.920), 19 3-pointers, 49 assists (4.5) and 28 steals (2.5) and is fourth in rebounds (3.0). The Lady Lions were an inside team last year with Player of the Year and Bradley recruit Chelsea Brackmann, a 6-2 forward, anchoring the offense. This season the offense has changed, with the pressure being on the perimeter people (mainly Hintz and Ludwig) to score. Eisenhower coach Gary Schmidt and his assistant Andy Monfre are working on constantly making adjustments. "Every coach, every year is dealt a new hand," Schmidt said. "Hintz, Ludwig and others key the offense. Our perimeter is important. We have to find that right combination. "Julia and Katie can't keep getting open all the time. Teams have already thrown a triangle and two and a box and one at us. We as coaches are trying to adjust. We need to change the dimension and dynamics. We need to put more pressure on the opposition, get some easy buckets. That's why coaching is so exciting when you make those adjustments." Looking back Hintz talked about starting as a freshman on a state championship team and how it has helped her the second time around. "It was awesome," she said. "I expected nothing more just coming on the team and just having a season on varsity basketball, but it definitely helped me this year coming up. It helped me so much. "I've definitely gained more confidence and it helped the team in general. Our team is doing a lot better from the start of the season. We have confidence coming into this season more than we had last season." Julia's play didn't surprise Schmidt, who saw her come up through the system. "I knew in fifth grade she was something special," he said. "She played up a grade all the time and I saw her development. I liked the way she was poised on the court. I was impressed with her ball handling and passing skills. She reminded me of Nicole Bauman (a former Ike player who went on to play at UW)." Hintz got into basketball early since her father (Dan) coached her older brother (Anthony) and sister (Christina). "He's the one who taught me and always went to the gym with me," Julia said. "He always rebounded my shot and really helped me. That's the person who taught me the game." Hintz first played organized ball in third grade with the Eisenhower youth program. "The girls made it super fun," she said. "It was just an overall fun sport. Even if you weren't working out it was still fun." Schmidt remembers Julia's maturity back in grade school. "She stopped and talked to me in neighborhood in sixth grade," he recalled. "She was confident, but had no ego. Last year even the TV announcers at the state said she did not play like a freshman, she played like a junior to have that big of an impact." 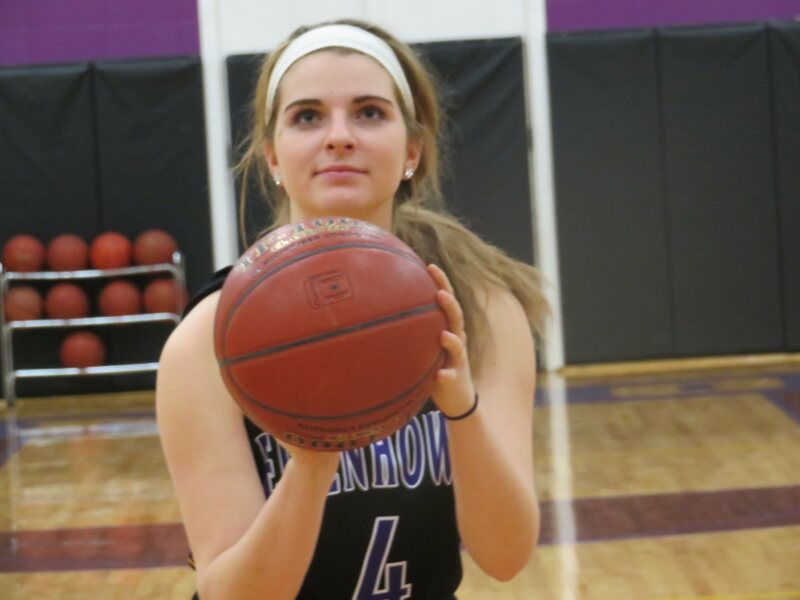 Hintz, who also plays tennis (singles and doubles) for Eisenhower, had no doubts about playing basketball in high school. Julia does see the Lady Lions improving and knows it's how you finish the season that's important. Eisenhower started 7-4 last year and finished with a 23-5 record, going 16-1 the rest of the way. "We're definitely working on Erin (Hedman, 6-2 freshman) in the post and Hannah (Plockelman, 6-2 junior forward) is a lot stronger now. I think it will get there once this season ends. I'm feeling good with the offense. I like having the ball in my hands. It makes you more confident because you know the calls." Schmidt feels that's one of Julia's attributes. "Her knowledge of basketball; she's very intuitive, very smart," he said. "She gives you an edge. She recognizes a situation. She can put up 20 points, but she would sooner get others involved. She picked up on those little things that make players great." Not surprising Hintz agrees with her coach. "People think it's all about scoring, but I take pride in assists and I really want to get everyone involved. Getting assists is way more important than points and getting everyone else involved is definitely a strength I have." Schmidt has also pounded home the point of how important defense is. "Coach always tells us you can have an off-game on offense, but you can't have an off-game on defense. I think that really gets in our head. We always have to have a good game on defense." Despite her impressive numbers, Julia had an interesting answer when asked what she needed to work on this year. "I definitely need to work on shooting," she said. "That's a negative I have this year. My shot hasn't been all that well. I just have to stay confident and hopefully it will go. You just can't get down on yourself. If you miss a shot, you have to have a short-term memory and get back on defense, get a steal and take another shot when you're open." When Schmidt was asked about what Hintz needed to work on, he took a while to answer. "That's a good question," he said. "She's a good practice player. Of course, she wants the team to be good first. Maybe her mental aspect. She'll get down on herself because she wants to be perfect. But she can't go out every time and be perfect. "She is always in the gym trying to perfect her game." Despite being only a sophomore, Julia is considered a leader by Schmidt, who officially has seniors Jasmyn Somarsingh and Abby Szukalski and junior Ludwig with the captain titles. "I don't want her to be forced into that role," he said. "But she is liked and respected by the people around her. People respect captains and on the court she is a leader without a doubt. She leads by example." Schmidt flashed a big smile when asked what Julia was like off the court. "She is a wonderful young lady, great personality," he said. "On and off the court she has a wonderful demeanor. She's a nice young lady and lot of fun. She's smart, good in school. She comes well prepared. "It's uplifting as a coach. She is someone who has more fun practicing than just in a game." Julia just feels having fun and winning go hand in hand. "We always say in the locker room before games to have fun and after the games just smile," she said. "When you have fun, you have success." FAVORITE MOVIE: Soul Surfer, Comedies & Horror. FAVORITE TV SHOW: Disney Channel. FAVORITE PLACE YOU VISITED: Riviera Maya, Mexico. WHAT DO YOU DO TO RELAX? Snapchat on phone. MOST MEMORABLE SPORTS MOMENT: Winning State Basketball Championship as a freshman.